Not too long ago, you wrote about straightening the leaders to get straighter quilts, but the article didn’t offer any tips for loading the quilt itself. 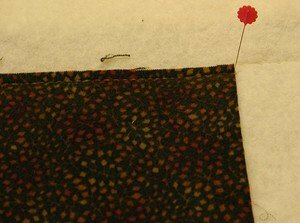 Can you please tell me if there is a trick to pinning the quilt on straighter? Kimmy says- Absolutely! 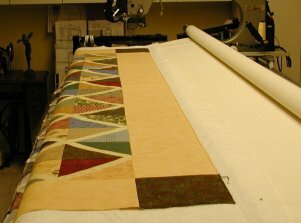 The way a quilt is loaded has a direct, and quite dramatic, effect on the appearance of the finished quilt. Wall quilts will hang better, bed quilts will lie flatter and drape nicely at the corners. Proper loading will make it far more likely that the corners will be square, edges flat, and blocks and sashing strips correctly lined up. These loading techniques are a snap to learn and, best of all, add no more than a few minutes to your loading time. Measure the quilt through the center to determine its size. Not the size the pattern says it’s supposed to be, but the size it really is. In this example, let's say the quilt is 98 inches wide. Place pins to mark the centers of the quilt’s top and bottom borders. On the machine’s 'top' leader, place a pin in the center of the leader. Measure out 49 inches to the right of center and place a pin there, then measure out 49 inches to the left of center and place another pin. Match the center pin on your quilt's bottom border to the pin marking the center of your leader, and pin the quilt and leader together at that spot. Now match the bottom right hand corner of the quilt to the pin that you placed at 49 inches to the right of the leader's center and pin the quilt and leader together at that spot. Match the bottom left hand corner of the quilt to the pin you placed at 49 inches to the left of the leader's center and pin the quilt and leader together at that spot. Now, pin the rest of the quilt to the leader, gently easing in any fullness as you go. When easing fullness, remember to ease it evenly; do not attempt to smooth it all the way to the other end of the border and then try to ease it all in the last four inches. Roll the quilt top onto the leader and out of the way, smoothing it as you go and doing your best to keep the quilt 98 inches wide as you roll. Next, pin your backing to the ‘backing’ and ‘take-up’ leaders as usual, making sure to smooth it as you roll to avoid wrinkling. Roll most of the backing onto the backing roller, leaving about 12 inches of backing exposed in your work area. Position the batting over the backing, gently smoothing out any wrinkles. Do not stretch the batting at this point, simply smooth it out flat. Place the top edge of the batting an inch or two below the top edge of your backing so that you'll have room to work on your quilt's top border without hitting pins (make sure your backing fabric is big enough!). Next, set your horizontal channel lock and stitch a nice straight line of stitches, basting the backing and batting together and creating a perfectly straight line to use as a guide when loading your quilt top. Unlock your channel lock and move your machine out of the way. Stick a pin in the center of that straight stitched line. 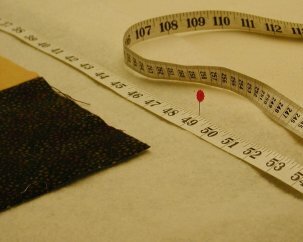 Measure out 49 inches to the right of the center pin and stick another pin into the stitching. Measure 49 inches to the left of the center pin and stick a third pin into the line. Unroll about 16 inches of your quilt top, flip it up so that it lies on top of the batting/backing, and match the pin you placed in the center of the top border with the pin you placed in the center of the stitched line. Match the quilt's upper right hand corner with the pin you placed 49 inches to the right of center (Photo A). 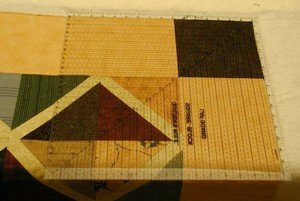 Set the horizontal channel lock on your machine to allow yourself to baste the quilt top into place atop the batting and backing, with the line of stitches being placed about 1/8 of an inch inside the border’s edge so they can be hidden within the binding seam allowance (Photo C). After basting the quilt top in place, smooth it out and measure it to ensure that it is still 98 inches wide. Baste the sides into place, again placing the stitching line 1/8 inch inside the border’s edge. Make sure that the corners look square before you stitch them down. I use a large square-up ruler for this task, as it makes straightening corners a snap. (Photo D). Execute the design work for this pass, then advance the quilt to expose a new work area. Work your way through the quilt, checking with each advance to ensure that the quilt remains the proper width, basting the sides in place as you go, and doing your design work before moving to the next advance. When you’ve worked your way to the bottom, you will do the same thing on the bottom edge that you did on the top; stitch a basting line to hold the batting to the backing, mark the center and corners with pins, line up the quilt, checking to make sure that the corners are nice and square, and baste the bottom edge into place. It has taken me longer to type out these directions than it will take you to implement this technique. This method adds no more than a few minutes to the total quilt loading time, but it yields very dramatic results and I think you'll be quite pleased with those results. If you are a beginner, you may also find that simply changing your method of loading will eliminate many of the issues that beginners often struggle with. Take a few minutes to try this technique and watch the finished look of your work improve! By using this method to load the top, you have laid the foundation for a straight, square finished quilt. Your quilt will be loaded at the proper width, so all you have to do during the quilting process is keep it straight as you go. The quilt’s corners will be crisp and square instead of pointy or dog-eared, and the quilt will be nice and straight, giving the finished piece a professional look.